My husband is a wise man, and God has placed him as the head of our home, so I like to talk through difficult things with him. He gives me a perspective that’s often quite different from mine. When I need to hash out confusion, I sometimes go to the small group of women I call my besties. They are godly. They love me. They like me. They laugh at and with me. They pray for me. They mentor me and provide counsel. We’re all in different seasons of life and have different needs for godly wisdom. I am a poppy, you are a rose, she is a daisy—we are a wildflower bouquet! If you’re single, divorced, or widowed, you might be the head of your home. If so, you could connect with a pastor for godly counsel, or a trusted friend who follows hard after Jesus, or a godly family member or coworker. Another person I encourage you to reach out to is the women’s ministry director of your church. Grab coffee or lunch with her. She will love you! What are your thoughts on this? Leave a comment on my wall. 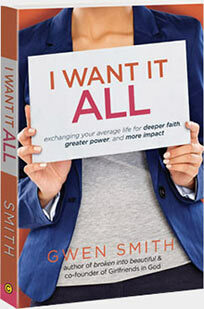 Today’s post is an excerpt from my newest book, I Want It ALL, which helps narrow the gap between our average ordinary lives and the not-so-ordinary promises of God found in His Word. We are meant to be women of impact who expect great things and move in the power and grace of Jesus. Thank you Gwen for a great topic. I am a pastors wife and share many things that were spoken here. A great tool that has helped me out tremendously is boundaries! This is so important. I have prayed and created a list of characteristics of a woman so that when I am building my core group of women, I know what she looks like. If I don’t have that list I become confused, frustrated, alone, separated and isolated because I have shared things with women that aren’t able or in a place to handle the things I shared. Since I have created this list it has been amazing!! I know when God is sending someone my way by the list of characteristics that He gave me, and I know when He’s not by the same. Sometimes it gets lonely in this process. Stay close to the Great Counselor because He will not place anyone in my path that will take His place. I remember before I created these boundaries I was desperate for some friends because I pour into so many woman. In my prayers the Lord told I was looking for woman to be my life preserver when only He can fill the spot that I was looking for someone to fill! Thank You Lord and I repented for looking to fill His spot with someone else. He has since given me 3 great women in my life that are Godly women that want more of Jesus!!! Hallelujah!!! I am new to the focused study of Christ and do realize how I lack friends I can trust. I have many friends from my social activities, gym and work, but feel a need to tap into those I would be comfortable sharing fears, insecurities, etc. thanks for this!!! Sorry for the pain you are going through. I’m honored that my blog is useful to help encourage your heart. Praying for you now, new friend. Hi GWEN. I’m a pastors wife & I praise God for the years He has allowed us to serve our Church & community. My husband is retiring at the end of the year. I have another 2 years to retire with full benefits. I know my husband would like me to retire much sooner. We are praying for God to guide us. You see when God guides & opens doors we will be ok. Please pray for me to understand God’s will at this time. This really confirmed my prayer topic for the past weeks. I only have one close friend, and they are not Christian. At my church, I have no one my age to relate to that isn’t family (and my family, unfortunately, spreads news quickly). Everyone else is younger or older, and have their own groups of friends. I’m kind of stuck in the middle. I didn’t really have a problem with this until about a week ago when it dawned on me that I have no one I can really relate to when it comes to the spiritual areas of my life. So I’ve been praying for God to bring me to some godly friends. 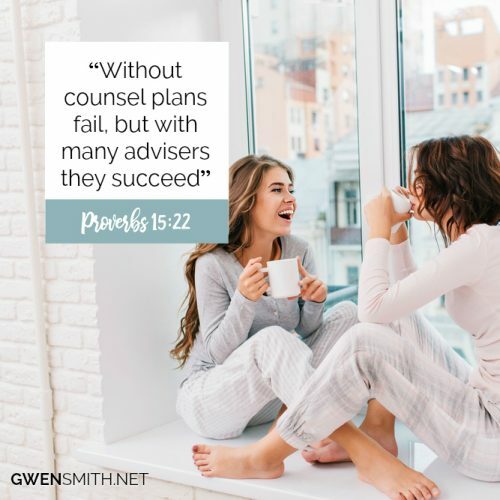 As a I read the question of do I have Godly friends to turn to it hard for me to talk to others as I am a pastor’s wife and my friends are sparse when comes to close friends. But throughout the years when we have pastor several congregations the Lord has provided those who I can talk to who could could give me advice. My mother was the one who I went to mostly because she was a very Godly woman and one who listen and very wise. She is in heaven with her Lord. She has been there since 1987. Another woman was a retired pastor’s wife who was very wise and was there when we were going through a rough time and she is now with the Lord. I am very fortunate I have a District Superintendent’s wife who is Godly woman and is one who is here for her pastors’ wives. She prays for us and supports us in our ministries and with our families. Her husband is our pastor and one who encourages us and prays for us in all that we do. He is there when we need him physically,spiritually, and mentally. He is truly God’s man. So yes I have those people in my life. I have husband who is truly God’s man also and love him dearly but at times he is not the one I can talk to but he is wonderful husband and father of our children. I can imagine not having him beside my side since we have been married for 451/2 years and have known each other since he was 14 and I was 15. The next question was am I to that to others and the answer is yes. I thank God for the situations we have been through so I may help others get through some of their rough circumstances and also have times of that we have praises to show people how God does provide the help and need were supplied. I’ve been at my church for about two years now. It’s really hard to find godly friends. When you think you have one. Your secrets are out to many. These women supposedly call themselves godly women. It’s very hard to find one. I know we should go to our Lord with all our worries, but sometimes we need one with skin on. Thank you for writing about godly friends today. Thank you for the suggestion to think of and thank 3 who have been godly counsel to me. Shame on me for not thinking of it myself, at least the “tell them” part. I did it right away and want to make it a habit. I really don’t have many friends. Especially godly friends. I took a promotion at work, which is keeping me from church now. Could you please help me pray that God give me good direction in what to do. I’m struggling sooo much. Thank you so much for all the devotions I so love reading them everyday!!! As I got up this morning, God had brought to me that we needed wisdom in a decision needing to be made. As God guided me, I found this post and it’s a perfect example of how to seek God’s wisdom not only from His Word, but from other godly counsel (friends). We’re new to the area, so I don’t have friends here yet, but I’m praying for God to lead me to them. It’s just a blessing to know God’s wisdom is perfect and He shows us we need others in this walk of life. How He works in other’s lives can help us in our own lives. Thank you for writing this! Well how cool is God and His timing? Just love hearing stories like this. He is just that personal and so, so good! Thanks for reaching out, Rhonda! Very wise counsel! There would probably be less divorce, unfaithfulness, child abuse and even suicide, if women would listen to wise counsel and turn off the TV watching how the world deals with life’s tough situations! 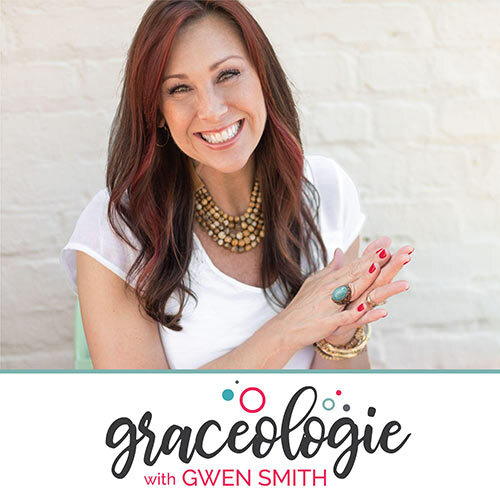 Thanks Gwen for being wise and speaking truth to the women of today! Yes! I choose the Word over the world any day!! Hugs and love to you, Nancy! 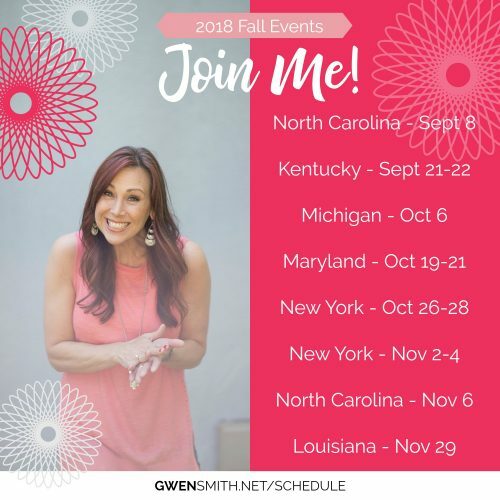 So much wisdom in this post, Gwen! We all need God’s counsel and Godly friends to help us out sometimes. I pray that I will be surrounded by God’s grace and be the kind of friend who will point the way to Jesus for everyone around me. Thank you for a wonderful reflection of the love of Jesus here today. Blessings! P.S. 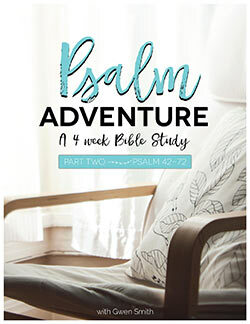 I’m loving Psalm Adventure and getting so much from it! I have been in a new place since November. I had a surgery and I am with my daughter. I have joined a wonderful church with a Bible Study. I am praying to find some that I could just get in a group for prayer. Prayer is sometimes rushed at the end of a Bible Study. thank you for this devotional. Thank you! I definitely believe in the power of prayer and if you don’t have Godly women you surround yourself with life can be hard. I have three women whom I love very much that gives me Godly advice. There is nothing better than hearing from God when life gets complicated. Yes, Anna! 🙂 Nothing better. PS I have had an Obsession with a young man for a long time but I now just email him a thoughtful line like Empathy-what is it? or about Prayer.Please pray that I try harder not to email him.He has kept my secrets and appears trustworthy but I don’t know this for sure. I’ve been a divorced woman for 25 years. It took many years to admit that description without an awkward self-consciousness. A host of negative labels & emotions surfaced when queries regarding marital status appeared. Major decisions were particularly vexing. My priest at the time recommended seeking wise counsel from a friend & fellow parishioner. We only met once, but he acted as a sounding board & encourager every Sunday. We met regarding a special program called the Accelerated Nursing Degree (AND) at Auburn University. I was concerned about finances: paying for tuition, books & living expenses while keeping my house. The official AND Advisor recommended not working while in the program. Some clinical rotations ended late at night & were 50 miles from home. Mornings & early afternoons were spent in the classroom five days a week or local hospital as dictated by the instructor. AND was a course of study accepting only a few graduates from disciplines other than nursing. The AND program no longer exists. It demanded too many resources, particularly instructor time, yielding only a small number of graduates. However, it was the best option for me at the time. My son was in the 7th & 8th grades, an exciting, but challenging age, while I obtained a second degree, a BSN. The AND program took 18 months to complete in preparation for licensure. My school experience was a miracle from start to finish & was definitely the path the Lord intended for me to follow. Turns out, I needlessly worried about financing my education & home, etc. When I graduated in August 1998, I owed not one dime. The women from my local parish, Holy Trinity, dispensed funds from a trust specifically for women returning to college to earn a degree. It was established in 1955 when Louise Glanton, a retired professor & member of Holy Trinity passed away. This is the same year in which I was born. The trust funds covered books every quarter I was in school. My parents assumed my mortgage for 12 months with my older brothers’ full & merciful backing. I had enough in savings to cover 6 months of the mortage. My son & I would collect aluminum cans to pay for gasoline money. One week I received $50 in cash. No note or return address was included & I really needed $50 that week! Throughout nursing school, my monthly gas bill arrived stating that due to past overpayments, nothing was owed. The Lord provided generous friends, some of whom remain anonymous. By my precious Lord & personal Savior’s Good Grace, I became an RN. School was far from easy. Being a bedside RN was challenging as well, but at the same time, very rewarding. I graduated with a BSN at age 42. I’m now 63 years of age & just retired last year. I’ve struggled with finding contentment in retirement. Last week, I met a young woman over the phone & then in person. She’s working in a the medical records department of a clinic I’ve recently joined. She wants to become an RN. Like me, she has a school-aged child. Fortunately, she has a husband & hospital experience as a Certified Nursing Assistant (CNA), both of which I did not have. I expect financial concerns are prominent as tuition is very expensive now. She says she needs a mentor to guide her to & through nursing school. I am her mentor. The Lord has answered my prayers. He is continuing to lead me through a purpose-filled life even in retirement. And that’s not all — as of last night, I have a little job. My prayer group friend & wife of a recently retired CEO from the local hospital, asked me to “check-in” on her mother-in-law every other day for the next month. [They’re downsizing from a huge house to a brand new home. They won’t have sufficient time or energy to spend caring for Grandmother properly.] Grandmother is 101 years young & resides in a wonderful assisted living facility; however, there is no medical staff. I’ll serve as her private duty RN & companion for a couple of hours each week. The Lord is good! The Lord is good indeed! Let us give thanks & praise to God Almighty who knows our needs far better than we think! so true we do end up with 4.a few friends. I have one that has been there me and me for them. I want more with my sweet friend. Thank you for the wake up call! I struggle, mostly from worldly stubbornness. I love reading things from you . You are an inspiration to me and so often line up with stuff going on in my life. Thank you and God bless you! Hi Gwen, oh this is so timely. Thank you so much for your messages. I am struggling to find a church and I have very limited Godly counsel. I have been betrayed on social media men etc, and in my own personal life I’m drinking st night to fill a void of loneliness that only God should fill. I have a beautiful daughter at home she’s 20 do we spur and encourage each other, but life is very painful right now. With issues of my age if parents and loneliness I just feel pain and am overwhelmed with sadness, fear and am lost. I do my devotional s daily some days good but I need to love God and trust him more. I could use some prayer. Thank you so much for listening. I too am struggling with friendships. I have some wonderful friends but they are too far away to get together with when I need to the most. I have recently had a Godly friend that I thought was flexible, who has made me feel like a terrible person without feelings for others. It has sent me into a depression that I can’t describe. I have to tell myself this too shall pass. I do know some wonderful Christian woman but now I am reluctant to share my soul with anyone. I need to pray for healing and the ability to trust again. It is sad that I now feel like I have to be careful who I share my life and feelings with. Right on time words. I really need Godly genuine friends as right now I have none. I have been praying for Gid to send some along the way and am still waiting. As right now am in a church but it’s as if I am alone no one to talk to who I can really trust. Please pray for me that God will send me some true trust worthy godly friends. Thank you Gwen for this post. It is exactly what I needed without even realizing it. Both my husband and I are fairly new in our faith, I mean we have always believed but we did not have a personal relationship with God nor attended church other than holidays. Due to changes in my husband’s job we moved from our home in Texas to Louisiana and then to Florida in just 3 years. Leaving our home to a place where you know not a single soul is hard. We were finally getting adjusted in Louisiana, which is where we rededicated our lives to God, and after only 2 1/2 years had to pack up and move to Florida where again, we knew not a single person. Even though we have found a church we love and joined a Wednesday night small group, I still feel isolated. Being new in my faith I have a lot to learn. Due to several factors, I have declined in making getting closer to God a priority. I believe being depressed has been the number one factor But I realized after reading your post this is exactly what I need. I need godly counsel. I need to make a connection with someone who can be my go to person. In a sense I need an accountability partner. Thanks for opening my eyes about something so simple yet so crucial to my spiritual growth. Gwen I’ve been going to my church for about 25 yrs. Things happened with my family and the Pastors of the extension church we attended at the time I felt was judgmental and so we decided not to atten. Now recently moved to another state and activrly attending our extentension of the same church I find myself alone and not having anyone to talk to or even vent to because I dont trust and I feel if I say to much I will get judged wrongly like the other extension church Pastors had. My family and I are very active I help a small group of woman but I feel so distance from my leaders and feel it’s a subject I dare not bring around any of them because they all stick together so ive been going to the Lord for this and am very careful of what I say and today yes I have no one to confide in that I can trust. What do I do? Thank you for this wonderful, inspiring post! I am newly widowed and could use some friends like you have. I will pray on this today, I was easily able to name three, but I hate to bother people. God will help me, I know. Thank you again for your wonderful words of wisdom. I prayed for a group of Godly friends to come into my life and they have. The difference in my circles today are like black and white. Without them I would not be in the wonderful place I’m in. They truly have helped me out of the pit and raised me to a better firm and faithful ground in which I walk daily on. I love my Godly friends.